The Moonstone (published in 1868) concerns the huge yellow diamond of the title. Rachel Verinder receives the stone as a gift not realising that John Herncastle who, it transpires, acquired the Moonstone by means of murder and theft has passed it to her in a sinister form of revenge. The stone disappears on the very night it is given to Rachel, and the tale concerns the unveiling of the culprit after the intervention of a famous London detective, Sergeant Cuff. A maid who is under suspicion commits suicide and Rachel herself is less than co-operative during the investigation. What does she know? Mysterious Indians pop up now and again and there is an air of confusion and the unknown until the mystery is eventually solved. Wilkie Collins had a professional relationship with Charles Dickens and actually wrote a piece for Dickens's weekly 'Household Words' in 1852. 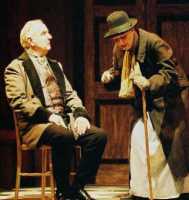 Although Dickens did not write mysteries Collins might have been influenced by him in some way. 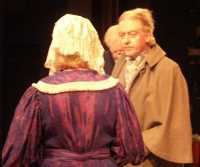 Whilst Collins' writing is probably much more difficult to adapt than that of Dickens, Nick Warburton's adaptation of this complicated story is excellent, using an ingenious method of re-enactment by which means the servants and close members and friends of the Verinder family tell the story by giving their personal version of events. 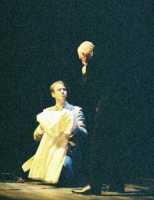 It transferred to the stage extremely well. Multi-part playing could have complicated things further had the actors not depicted each of their several characters so well. This was true ensemble playing which makes it both difficult and unfair to single anyone out. All the actors gave good, polished performances. Special mention must be made though of some excellent cameos. 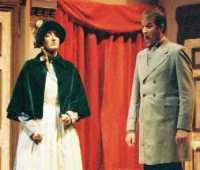 Mandi Cattell for her Jewish Pawnbroker Rosemary Eason as the pamphlet waving cousin, Sara Halse as an exuberant Gooseberry and Colin Lawrence whose scene with himself as both Bruff and the Indian traveller Murthwaite was highly entertaining and amusing. There were also some great theatrical moments worthy of mention such as the departing train and a fine piece of buttock warming. 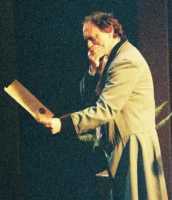 Nick Warburton chose to act in his play and I am sure he would have got a good feel as to what worked and what didn't. I would say that most of it worked, although I felt that a couple of bits of re-enactment of the re-enactment towards the end of the play were a tad unnecessary. I think it was slightly overlong and maybe 10 minutes might well be knocked off with a little pruning. 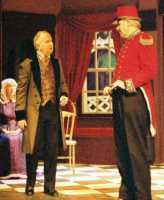 The production was excellent technically with a fine setting designed by Tony Broscomb, some exceptionally good and atmospheric sound and lighting by Graham Potter and Mark Easterfield respectively and ingenious use of costume to depict change of character brought about by the skills of Margaret Thorp. Congratulations to director Ron Meadows, writer Nick Warburton and to Bawds for yet another great piece of family theatre.